Popularly known as the Golden City, Jaisalmer was founded in 1156 AD atop the Trikuta Hill by Rawal Jaisal, a successor of the Yadav Clan. The city of Jaisalmer is located in the heart of the Great Indian Thar Desert and looks like a poem written in sand. The golden colored sand surrounding the city adds charm to it. It is believed that Lord Krishna, the head of Yadav Clan predicted to Arjuna that years later a descendant of the Yadav clan would lay the foundation of his kingdom on top of the Trikuta Hill and this prediction manifested in 1156 AD when the city was founded. Jaisalmer Fort: It is the most popular destination of Jaisalmer. The beauty of the fort makes one gasp in awe. It was built in 1156 by Rawal Jaisal. Fortified with massive walls, the fort is extremely beautiful from inside. The fort has beautiful establishments such as Raj Mahal, Jain Temples and the Laxminath Temple. It greatly inspired the famous Indian film maker Satyajit Ray who made a film on it. Patwon ki haveli: It was built by the members of a very rich merchant family. It is the most stunning haveli of Jaisalmer. Salim Singh ki haveli: Built in 1815, this haveli is famous for its arched roofs and finely carved brackets in the form of the national bird peacock. Nathmalji ki haveli: It is noted for its ornamental beauty. Camel Safaris: Your visit to Rajasthan remains incomplete if you discard the chance of riding on a camel. 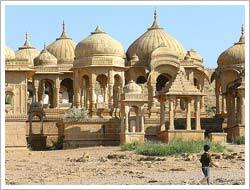 And Jaisalmer camel safaris give you an enchanting experience of a desert. Several museums in the city display royal possessions of the bygone era. If you want to see the desert come alive the best time to come here is between January-February as in this period the famous Desert festival of Jaisalmer is held. The festival gives a beautiful picture of the Rajasthani culture. Flights are available to reach Jaisalmer. A railway link connects Jaisalmer with all major cities. Regular deluxe and semi-deluxe buses connect Jaisalmer with Jaipur, Ajmer, and Bikaner. Distance: New Delhi (864 km), Jaipur (558 km), Mumbai (1177 km), Ahmedabad (626 km).